1Department of Medicinal Chemistry, College of Pharmacy, University of Sharjah, UNITED ARAB EMIRATES. 2Department of Pharmaceutical Chemistry and Pharmaceutics, Moradabad Educational Trust, Group of Institutions, Faculty of Pharmacy, Uttar Pradesh, INDIA. 3Sharjah Institute for Medical Research, University of Sharjah, Sharjah, UNITED ARAB EMIRATES. 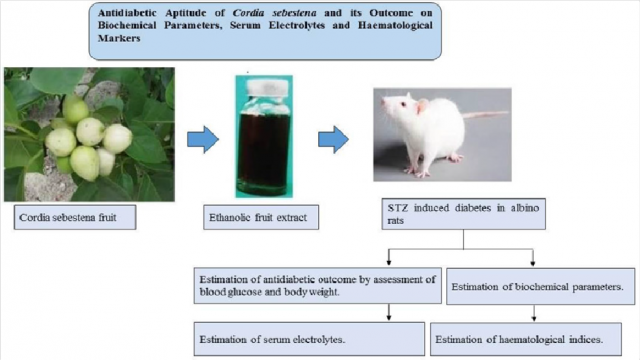 Objective: The present study investigated the antidiabetic outcome of ethanolic extract of Cordia sebestena fruit (EECSF) in streptozotocin (STZ)-induced diabetogenic rodents and evaluated its consequence to improve the level of biochemical parameters, serum electrolytes level, and hematological indices along with its impact on body weight. Materials and Methods: The albino rodents were selected to observe oral glucose tolerance test by oral intake of aqueous glucose solution (4 g/kg, body weight) in normal rodents and assessment of blood glucose level after administration of EECSF at 100 and 200 mg/kg and standard drug glibenclamide at 0.6 mg/kg, body weight. Antidiabetic activity was estimated in the chronic biological model by STZ (65 mg/kg/i.p. )-induced diabetes in rodents escorted by the determination of blood glucose. Further pharmacological research was carried out to explore the effect of EECSF on body weight, variations in biochemical parameters including aspartate aminotransferase, alanine aminotransferase, alkaline phosphatase, total bilirubin, and total protein, transformations in serum electrolytes such as Na+, K+, Cl−, and Ca2+ along with estimation of hematological indices such as red blood cells, white blood cells, hemoglobin, lymphocytes, neutrophils, eosinophils, and monocytes. Results: It was discovered that EECSF significantly lowered the blood glucose level of diabetic rodents along with enhancement in body weight. Correspondingly, EECSF significantly ameliorated the biochemical parameters, serum electrolytes, and hematological indices. Conclusion: The results demonstrated the antidiabetic potential of EECSF in STZ-induced diabetes in rodents, and it could be selected to benefit from diabetes and its affiliated complexities inclusive of anemia, diabetic nephropathy, retinopathy, neuropathy, and hepatitis. Chaudhary S, Verma HC, Gupta MK, Kumar H, Swain SR, Gupta RK, et al. Antidiabetic Aptitude of Cordia sebestena and its Outcome on Biochemical Parameters, Serum Electrolytes, and Hematological Markers. Pharmacognosy Journal. 2019;11(2):418-423.